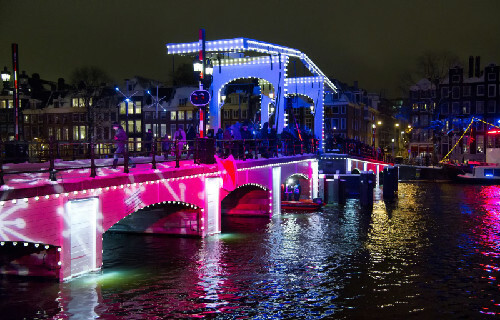 December and January now have an added sparkle in Amsterdam each year as we now have an annual festival of light. Many of Amsterdam's most famous buildings and bridges are lit up and other unusual lighting effects filling the night sky. An amazing sight indeed. Below are a few we managed to get during the month. Now an annual event, every November to January. In the Netherlands, very few people look forward to the end of fall and the darkness that accompanies it. With the sun setting earlier, the clocks set back an hour and the cold ever so slowly creeping up on the city, the gray days and early nights seem like a recipe ripe for gloom. But fear not! Amsterdam is a city that refuses to fall victim to the weather and instead uses it as an opportunity. How, you may wonder? Well, in addition to the lantern inspired lights that line the canals of the inner-city, Amsterdam plays host to a series of light festivals, street displays and special events that bring ideas of illumination to new heights. Beginning in November, the run-up to the holidays is reason enough to break out the Christmas lights, but the city goes one step further. Along with the quintessential bulbs that line the bridges, there are a series of festivals and decorative lighting displays that not only make the streets cozy, but also downright interesting. If you’ll be making a trip to Amsterdam in the winter (and I certainly recommend you do! ), be sure to explore these inspired examples of how lighting can transform a gray day into a cheery night! Running from November 27 until January 18, this event is truly spectacular. Through the combined efforts of the city of Amsterdam and a consortium of business sponsors that include KLM, BlockBuster Funds, the Luxury Hotels of Amsterdam, and the Amsterdam Fonds voor de Kunst, the Amsterdam Light Festival is a showcase of 33 light based sculptures and objects from artists around the world. From the more than 260 entries, the 33 pieces that are exhibited are chosen by a jury of artists and experts not only for their aesthetic quality, but also their innovative play with the cityscape and their relation to the annual theme. In terms of works, we’re not talking small, dimly lit fluorescent sculptures. Previous editions have included awe-inspiring, major pieces. Temporal Tower by visual artist Todd van Hulzen, for example, consisted of constructing a 100 foot tall sculpture of scaffolding, mesh and 36 powerful LED lights that would glow purple, blue and red in homage to the Herring Packers’ Tower that stood outside of Central Station until 1829. 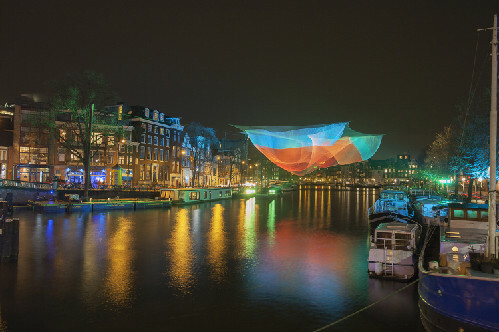 Or consider the massive 230-foot net-based sculpture 1.26 Amsterdam hung over the Amstel River in 2012 that reflected stunning colors while seemingly floating in mid-air. Take time to walk the inspiring Illuminated route and explore all of the jaw-dropping works by land while getting a great tour of the city. Alternatively, book the Water Colors boat route and marvel at Amsterdam from the canals while admiring the divine combination of art and light. The best part: the walking tour is completely FREE! The Bijenkorf is one of the most well-known department stores in the Netherlands. Although they have multiple locations throughout the country, their massive 5 story location at the heart of Amsterdam is their flagship. A beautiful building with facades facing both Damrak and Dam Square, the store always kicks-off the holiday season with a brilliant light display. Meaning “the Beehive” in English, the Bijenkorf lives up to its name by lining their building with over 400,000 LED lights in distinct honeycomb shapes. As time has advanced, so has the innovative light technology. Now the honeycombs, snowflakes and stars all seem to participate in a choreographed dance that immediately put you in a holiday mood. If you’re visiting in November, be sure not to miss the night that they literally “Turn on the Lights”! Free to the public, Dam Square fills with spectators on the night of November 20 to see the annual show. Inviting aerial acrobats, musicians and street performers from France, huge decorative floats fill the skies while fireworks go off, ultimately ending with the entire building illuminating in stunning fashion! A helpful tip: the Bijenkorf stays open late that night and you can get some shopping done while listening to the sounds of live musicians inside! Along with major displays, some of the more stylish areas of the city put up their own lights above the streets not only to create a bit of neighborhood definition but also to make them absolutely adorable. If you’re looking to do some boutique browsing in the hippest district in town, look no further than the Negen Straatjes or 9 Little Streets. Consisting of the area between the Huidenstraat, Hartenstraat, Prinsengracht and Singel, this area of the Jordaan district is packed with the coolest independent brands in town, loveable cafes and a very cool vibe. While browsing the stores, don’t forget to look up! Each winter, the streets are lined with chic lights displaying a simple “9” in blue and red that somehow make the area even cooler. If you’re renting an apartment closer to the center, be sure to visit the Café in de Waag on the Nieuwmarkt. Not only will you be eating and drinking in one of the oldest buildings in the city (15th century! ), but it offers a great view on the lights around the vibrant square. In contrast to the neighboring Red Light District, the ornamental lights take the shape of elegant snowflakes. Throw in a Christmas tree that is prettier than the one on Dam Square and you have your own little light festival! Of course the main shopping arteries get in on the light action come winter time. After a substantial upgrade in 2012, the displays on these two streets spell their names in bright lights! To add some charm to the endless storefronts, chandelier-like structures resembling oversized ornaments hang over the center of the streets. The area is especially worth perusing before Christmas when they thrown in some music courtesy of talented buskers! Helpful hint: The streets are only separated by Dam Square, which also gives you the chance to see the city’s most famous Christmas tree just outside of the Royal Palace! Crossing the southern portion of the Grachtengordel, the Utrechtsestraat has received a serious make-over in the previous years. Lined with welcoming cafes and unique shops (don’t miss the record store Concerto! ), the street has taken steps to improve the atmosphere at night via decorative lighting. In a display that is elegant, yet striking, the buildings are lined with bright, icicle-light curtains that seem to drape over the center of the street. The dense repetition of such a decoration is breathtaking and riding under the canopy of lights on your bicycle truly feels as if you’ve entered some type of Christmas forest! An absolute classic, it would be a mistake to miss this bridge fully lit up around the holidays. Located just north of the famous Koninklijk Theater Carre and the Amstelsluizen (the lochs where large boats pass to enter the city), the Magere Brug, or “Skinny Bridge,” is a small white bridge that radiates character. Built in 1691, the central portion of the structure is composed of a bascule bridge made of wood. 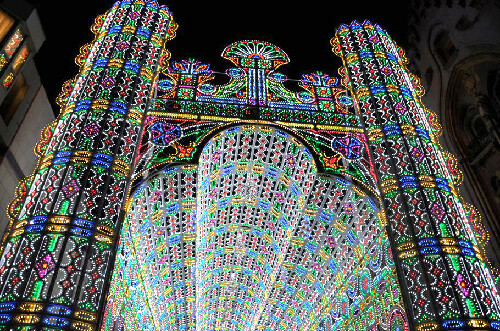 A mundane shade of white during the day, the bridge comes to life at night when 1,200 light bulbs turn-on to create an enchanting outline. Looking for a romantic photo opportunity in Amsterdam? The Magere Brug is your chance! With no cars allowed on the bridge, there’s plenty of space to make that quintessential vacation photo to remember. From the quotidian to the extravagant, wait till dusk and then get out and soak up the winter time light displays Amsterdam has to offer!